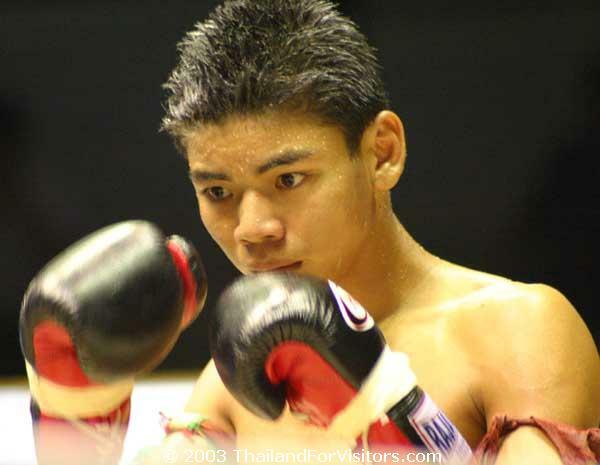 A Thai boxer looks for an opening. Thai boxing (muay Thai) is perhaps the one sport most identified with Thailand. While it is a gruelling sport that demands a great deal of strength, flexibility and endurance from its combatants, it has a spiritual dimension that isn't usually associated with sports. The sport evolved from early forms of armed combat. It is first mentioned in 1411, but most likely evolved much earlier. The sport became so hard on the participants that it was banned in 1920, but was revived in 1937 with new rules to protect the fighters. Each fight starts with a prayer, and a dance. You get to see the spiritual aspects of Thai boxing at the beginning of each fight. Before the fight begins, both boxers kneel in prayer to their teacher (wai kru) and then do a sort of dance (ram muay) that is part warm-up and part ritual to draw the powers of the earth spirits. The 'dance' varies according to the boxer's training camp. The ceremony is accompanied by phipat music played by a band consisting of a reed recorder that sounds a bit like bagpipes, finger cymbals and drum. 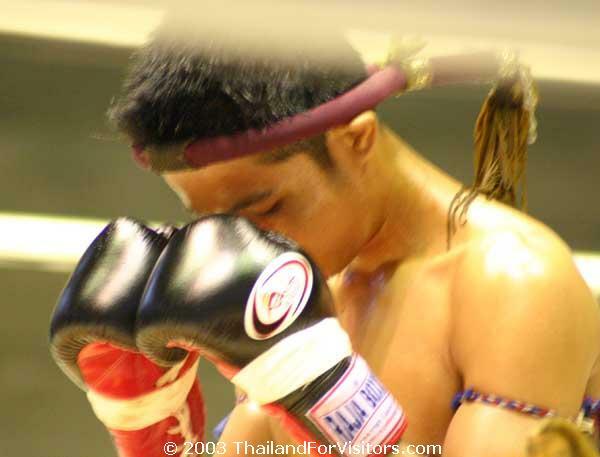 A hoop resembling a small tennis racket with the strings removed is worn on the head during the ram muay, then removed by the coach before the fight begins. You may also see bands or what even appear to be scarves tied around most boxer's biceps. These may contain a Buddha amulet or a herb that is believed to bring the wearer good luck. A boxer lands a kick to his opponent. Once the preliminaries are completed, the actual boxing begins. A fight consists of five rounds lasting three minutes each. The fight is judged by three men, each siting in a separate box on three sides of the ring. Points are awarded for each blow a fighter manages to land on his opponent. Only the groin is 'out of bounds'. A boxer gets a brief rest between rounds. Between rounds, the fighters get rough rub-downs from their trainers, who also douse them with water. Supporters in the fighter's corner shout words of advice. It is at this time that you can most easily see how gruelling this sport is on its participants. Supporters in the blue corner watch the fight with great intensity. In addition to the fascinating fights themselves, Thai boxing matches are great people-watching opportunities as well. The fighter's corners are always filled with interesting characters who watch every second of every round with great intensity. The crowds in the 'cheap seats' can be just as interesting. The time to watch them is between rounds, when bets are made. A complex system of hand signals is used to convey the bets. In Bangkok, matches are held every Monday, Wednesday, Thursday and Sunday at the Ratchadamnoen Stadium. Lumpini Stadium hosts fights every Tuesday, Friday and Saturday. Lumpini Stadium can be easily reached by MRT. Alight at the Lumpini station. Fights start around 18:30 and generally consist of a 10 fight card. Admission fees for tourists range from 1,000 (25.97 USD) to 2,000 (51.94 USD) Baht for ring-side seats. Fights are held in cities all over Thailand. Many tourist areas will have one or more bars that put on show fights. These are generally staged and no comparison to the real events. Many westerners are interested in learning Muay Thai, and as a result there are a number of "schools" ready to cater to their desires. Some are reputable, and no doubt some are not. Among the reputable seems to be Chacrit Muay Thai in Bangkok. They are fully accredited, which means they can not only teach you to box properly, they can also help you get a student visa to stay in Thailand while you study.